Also suitable for gerbils, mice, rats, and other small pets. Product dimensions: 27cm x 25cm x 20cm. 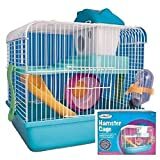 un packed hamster cage which provides pets with an entertaining venue as well as a safe and secure place for sleeping. A fabulous and sumptuous choice for your feline friend, this MIXSE Cat Sleeping Bag offers your pet a great place to hide and snooze.